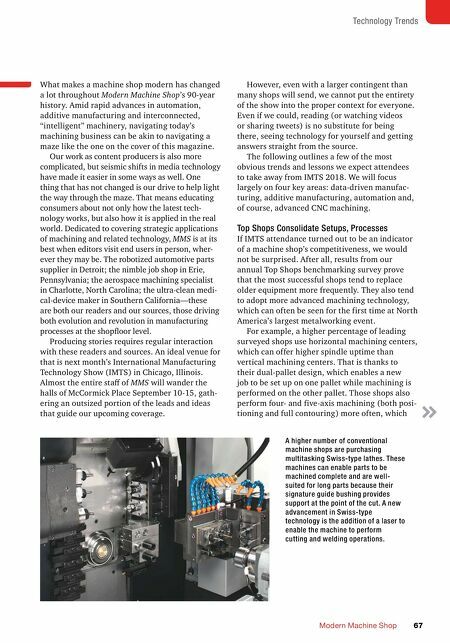 Technology Trends Modern Machine Shop 67 What makes a machine shop modern has changed a lot throughout Modern Machine Shop's 90-year history. 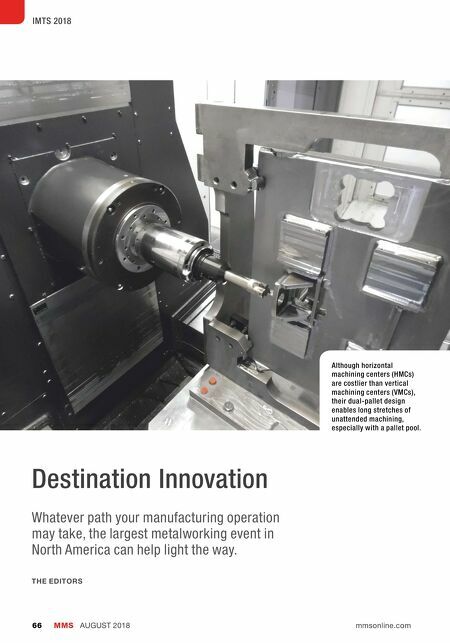 Amid rapid advances in automation, additive manufacturing and interconnected, "intelligent" machinery, navigating today's machining business can be akin to navigating a maze like the one on the cover of this magazine. Our work as content producers is also more complicated, but seismic shifts in media technology have made it easier in some ways as well. One thing that has not changed is our drive to help light the way through the maze. That means educating consumers about not only how the latest tech- nology works, but also how it is applied in the real world. Dedicated to covering strategic applications of machining and related technology, MMS is at its best when editors visit end users in person, wher- ever they may be. The robotized automotive parts supplier in Detroit; the nimble job shop in Erie, Pennsylvania; the aerospace machining specialist in Charlotte, North Carolina; the ultra-clean medi- cal-device maker in Southern California—these are both our readers and our sources, those driving both evolution and revolution in manufacturing processes at the shopfloor level. Producing stories requires regular interaction with these readers and sources. An ideal venue for that is next month's International Manufacturing Technology Show (IMTS) in Chicago, Illinois. Almost the entire staff of MMS will wander the halls of McCormick Place September 10-15, gath- ering an outsized portion of the leads and ideas that guide our upcoming coverage. However, even with a larger contingent than many shops will send, we cannot put the entirety of the show into the proper context for everyone. Even if we could, reading (or watching videos or sharing tweets) is no substitute for being there, seeing technology for yourself and getting answers straight from the source. The following outlines a few of the most obvious trends and lessons we expect attendees to take away from IMTS 2018. We will focus largely on four key areas: data-driven manufac- turing, additive manufacturing, automation and, of course, advanced CNC machining. Top Shops Consolidate Setups, Processes If IMTS attendance turned out to be an indicator of a machine shop's competitiveness, we would not be surprised. After all, results from our annual Top Shops benchmarking survey prove that the most successful shops tend to replace older equipment more frequently. They also tend to adopt more advanced machining technology, which can often be seen for the first time at North America's largest metalworking event. For example, a higher percentage of leading surveyed shops use horizontal machining centers, which can offer higher spindle uptime than vertical machining centers. That is thanks to their dual-pallet design, which enables a new job to be set up on one pallet while machining is performed on the other pallet. Those shops also perform four- and five-axis machining (both posi- tioning and full contouring) more often, which A higher number of conventional machine shops are purchasing multitasking Swiss-type lathes. These machines can enable parts to be machined complete and are well- suited for long parts because their signature guide bushing provides support at the point of the cut. A new advancement in Swiss-type technology is the addition of a laser to enable the machine to perform cutting and welding operations.